I first met Bianca back when in twenty thirteen when I was only twenty. help and listen. This is how we began our journey. with a new found enthusiasm. others stood out amongst the rest. become the strong warrior that I am today! Thank you to Bianca for everything you have done for me and continue to do. The most benefit from the counselling was my motivation. I also got to know myself better. Both those things made me able to balance my life. I loved the tranquility and views. It feels peaceful and I felt like it was a safe place to talk honestly about my issues. 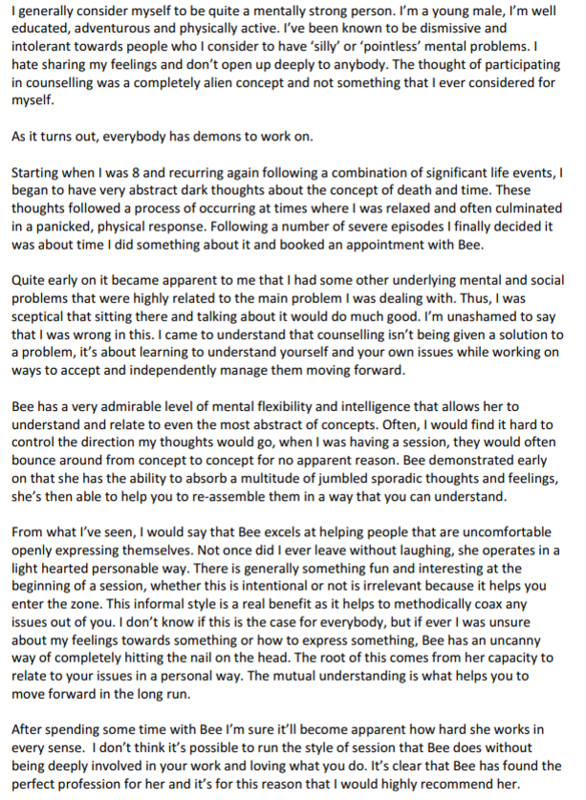 I can recommend Bee-Released because it helped me get over my depression and have a better outlook on life. I now have monthly sessions to keep me on track. Counselling seemed scary at first but I felt comfortable and I was surprised at all the things that I had bottled up. I was able to talk freely and not be judged.